The sheer scope of New York City is hard to understand until you have traversed the Brooklyn Bridge, inaugurated in 1883, which crosses 5,989 feet (1,825 m) of the East River and connects two of New York's biggest metropoles, Manhattan, and Brooklyn. The construction of the bridge was an impressive feat of engineering ingenuity and upon completion it was the longest suspension bridge in the world. Today, it is a treasured landmark of the city, colourfully illuminated at night to highlight the architectural towers and hangings. There is a pedestrian walkway from which visitors can savour vistas of both Manhattan and Brooklyn. 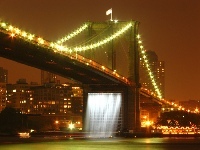 Photographers looking for quintessential New York cityscapes should be sure to walk the bridge.